Something must be wrong in the land of Muppets. First PBS announced that "Sesame Street" would kick off its 36th season this week with a multiyear story arc about healthy habits. No problem there; childhood obesity rates are soaring. Then I learned of changes that turned my "Sesame Street" world upside-down. 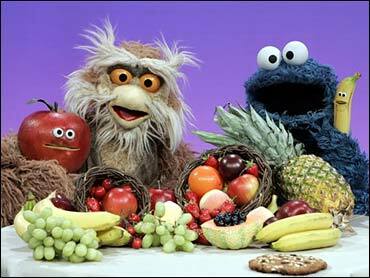 My beloved blue, furry monster — who sang "C is for cookie, that's good enough for me" — is now advocating eating healthy. There's even a new song — "A Cookie Is a Sometimes Food," where Cookie Monster learns there are "anytime" foods and "sometimes" foods. Being a journalist, I did the only thing I knew how to do. I investigated why "Sesame Street" gave Cookie Monster a health makeover. The answer would lead me into a world where television producers worked with health experts and politicians, a place where Cookie Monster does care about his health, and by association, the health of children. The first place I headed was the Internet. On the Sesame Street Web site, little had changed. There was Cookie Monster, in all his blue furriness. He was holding a plate of cookies. He was chomping on a cookie. He still looked the same. But as we all know, looks can be deceiving. So I searched the site for news on Cookie Monster and up popped a press release about the show's "Healthy Habits for Life" emphasis. Buried near the bottom was a one-sentence mention about Cookie Monster eating fewer cookies. But what did that mean? Scarfing one plateful instead of two? I picked up the telephone. "What's going on with Cookie Monster?" I asked the "Sesame Street" press office. "Why are you doing this?" They sent me to Dr. Rosemarie T. Truglio, the show's vice president of research and education. She said the show changes every year, focusing not just on teaching numbers and letters but also emotional and physical health. With the rise in childhood obesity, Truglio said "Sesame Street" is concentrating on the need to teach children about healthy foods and physical activity. This season, each episode opens with a "health tip" about nutrition, exercise, hygiene and rest. Truglio said "Sesame Street" also will introduce new characters, such as talking eggplants and carrots, and offer parodies, such as "American Fruit Stand." Even guest stars will address healthy activities, such as Alicia Keys talking and singing about the importance of physical activity. Even politicians have gotten into the act, filming public service announcements with "Sesame Street" residents. In one taping, Senate Majority Leader Bill Frist taught Elmo to exercise — jumping up and down. In another, Sen. Hillary Clinton and the small red monster discuss the various textures and tastes of foods. But what about their position on Cookiegate? "Even Cookie Monster is learning to control his cookie cravings," Frist told me by e-mail. "His sage advice opened our eyes to the simple joys of a tasty cookie and now reminds us that moderation is the key to healthy living." "We are not putting him on a diet," said his spokesman, Truglio. "And we would never take the position of no sugar. We're teaching him moderation." The furry one also plans to try different kinds of cookies (read: healthier cookies) rather than his just staple, chocolate chip. But will he still scarf his food? Yes, plus the occasional object, Truglio said. But isn't that unhealthy? Her reply: He's still Cookie Monster. Cookie Monster appears to be happy with the new "sometimes food" song, because at the end he warbles: "Is sometimes now?" So there it is. Cookie Monster still gobbles cookies, he's just a healthier version of his old self. His eyes are still googly, his fur is still scruffy and he's still messy. Even "Sesame Street" recognizes that we all need guilty pleasures.